It's not all fun and games when kitties get together. If your kitties are in an all-out war with each other, take heart. You might not get them to love each other, but there are things you can do to stop the fighting. With time -- and lots of patience -- you might even get them to like each other. Desex both cats if you haven't done so already. 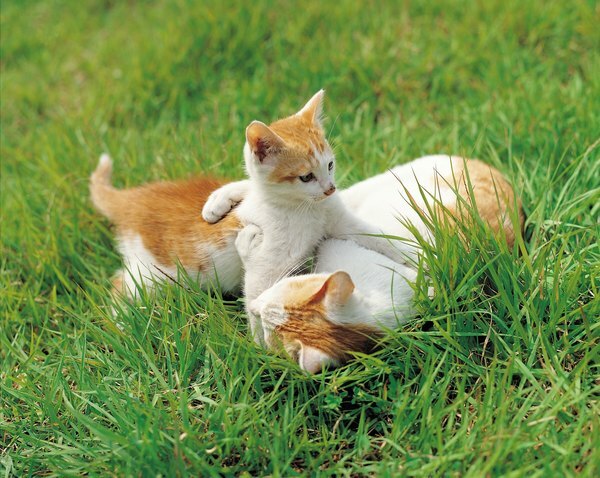 Two intact males will fight for almost every reason under the sun, including territory, females -- even if no females are around -- and being the "top boy cat" in the house. Two females might fight over their role and being the alpha cat in the house. If you have a boy and a girl, fighting is the last of your worries, so fix them quick. Provide doubles of everything, so there are no fights over "this is mine, mine!" Place two litter boxes in different areas of the house, buy catnip toys for each kitty and make sure you have at least two cat condos -- and place them near different windows. If they know they can easily retire to their own corners, they might be less likely to fight over things. Feed them separately. Even better, place several bowls of food around the house, so they have access to food at all times. There's no way either cat will be able to claim ownership over a specific bowl if you have several full ones out at all times. And if the fights are over food, this will definitively put an end to it. Give both cats access to the whole house so they can take off and hide in different rooms if they want to avoid their roommate. Even better, place kitty beds or hiding places in different areas of the house, which either cat can use as a "leave me alone" space when they want to avoid company. If there's any chance you're showing preference to one cat over the other, stop it. They might be picking up on this and fighting over who gets to enjoy the human's company more. Are Ear Mites Contagious Between Cats and Dogs?